I can always count on my dear friend Ruth Handel to make an idea better or to have just the spot-on suggestion. 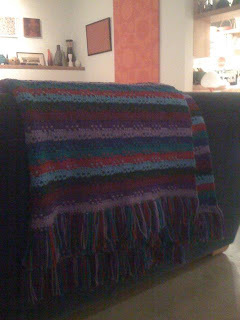 So after reading my blog about the crocheted coral reef, she jetted over an image of the rich and inviting afghan my sister, Cheryl, power crocheted for her and her husband Lloyd's wedding gift a few years back. Even though Ruth and Cheryl have never met, I'm sure they would be fast friends. And each time I visit Ruth's home in Mar Vista, CA, there's always a sweet reminder of my sisters handiwork lounging on the back of the living room sofa.